Application Performance/APM/UI News & Research! The goal of application performance management framework is to provide the end-users with the absolute best experience from beginning-to-end. While most APM tools are designed to proactively detect and troubleshoot performance issues to minimize its affect on users, its actual framework is among the most important feature when it comes to ensuring users have a highly successful experience throughout all even patterns. 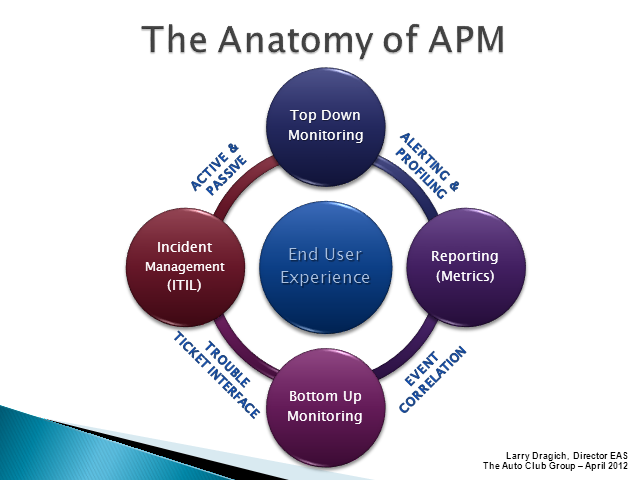 Experience Monitoring – User experience monitoring through an APM framework is done without the use of an agent. It’s a network based tool that actually tracks user transactions through the physical system and reports on various metrics established within the APM framework. Generally, this type of reporting and monitoring is referenced as “passive monitoring.” However, there is another level of experience monitoring referred to as “active monitoring,” which utilizes synthetic, or test, transactions to continuously test the application and all its events and processes. 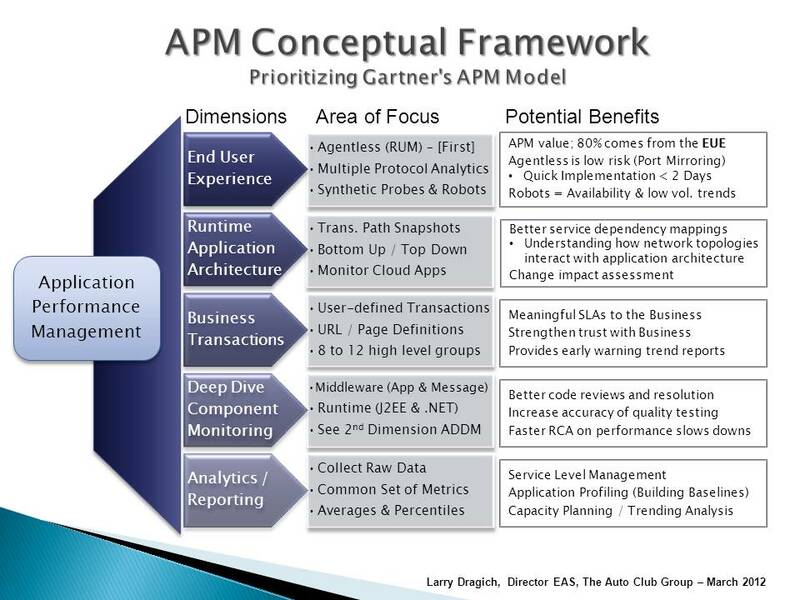 This APM framework element tends to catch errors and performance issues before they alter the experience of users. Runtime Architecture – This form of APM framework utilizes a unique tool to fully understand what infrastructure elements are used for particular application components. Through the use of automated software, the application infrastructure is continually monitored to ensure all of its components operate to their highest levels of performance. Ultimately, this framework element determines all areas of applications run according to the standards you set forth. Transaction Monitoring – The transaction level of your APM framework is the level at which all application functions are broken down into categories, which allows IT managers and system administrators the opportunity to review specific segments within their entire business structure. In terms of end-user experiences, transaction monitoring is among the most important framework factors you must consider for smooth and succinct experiences. Deep Dive Monitoring for Problem Resolution – Deep dive component monitoring is the primary element of an APM framework capable of resolving problems and reporting component-specific metrics, such as the database and middleware. This element of APM framework is key to discovering specific application errors and tracking the errors to its root cause, which can be exhausting and time consuming without proper APM framework. Analytic Reporting Capabilities – Regardless of your applications, or their function, only select an APM framework capable of providing your business with highly detailed analytic reports based upon a set of metrics established by your network administrator. 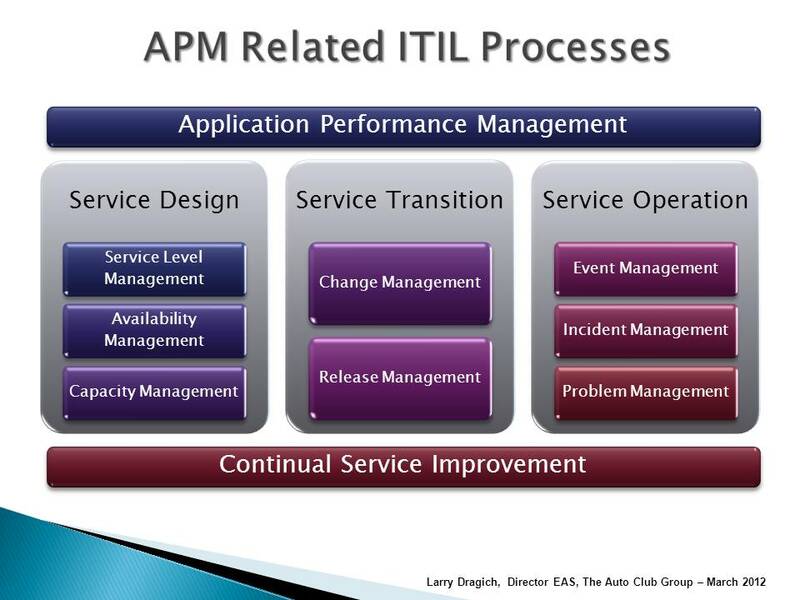 Implementing each of these levels into your APM Framework isn’t necessary for every type of business. The number of levels you apply is based upon your specific performance risk threshold, which should be discussed in high detail with your IT manager/director. A good example of using the APM Framework is Hoverwatch, specialized software for remote monitoring of children's or employees' activities on smartphones or computers. In the course of its development, the APM technology was utilized to the fullest and dramatically improved the quality of the service for end users. Application performance management has moved from being found primarily in large corporations with complex network infrastructures and critical application use to being utilized in start-up ventures and personally maintained web sites. While the overall purpose of APM solutions is to ensure users continually experience solid and fully-functional applications, the goals of application performance management delve far deeper into the recesses of business operations. Regardless of your specialty, all businesses must have a universal goal: to maintain a solid state of continuity in terms of website access and user experiences. In our modern world, customers have a plethora of options. If a site experiences any downtime in the function of their application, customers have no problem moving on to your competitor. Cultivating a sense of continuity is among the primary goals of APM solutions. This is achieved by reducing downtime, up to 70 percent less downtime, by continually monitoring end-to-end application performances and running real-time diagnostics to identify current or potential issues. Such activities are essential to maintain optimum application performance during high-usage activity, which can be identified by reviewing application user trends and patterns. By improving the application functionality and performance, you’re automatically enhancing the experience had by all users. While a major goal of APM solutions is to provide constant monitoring and management of application and network infrastructure, especially when multiple servers are used to host multiple applications, the end goal is always the same: to create an enhanced, and stable, end-user experience. Sometimes in order to create an experience it may be necessary to utilize a strategy that involves the monitoring and management of application performance processes. When you eliminate the need to spend hours researching and identifying application errors, employees are able to dedicate more time to other projects. In fact, a study released by TRAC Research found businesses who implemented an APM solution experienced a 59 percent monthly reduction in man-hours spent troubleshooting application problems. This reduction in time translates into a significant boost in employee productivity and ability to accomplish other necessary tasks. Ultimately, this leads to a snowball effect, resulting in greater customer service, product management and business operations. Many business owners aren’t aware that one of the primary goals of APM solutions is to increase website rankings in Google and other search engines. The reason? Search engines rank websites not only by content quality, but by website speed. When an application performs at its optimum speeds, its Apdex scores prove to be very attractive to search engine robots. Such performance and functionality is awarded with higher rankings, which significantly increase organic site traffic. Need to increase your website traffic through organic methods? Review your content, but also, implement an APM solution. Regardless of the complexity of network and web applications, the use of complex event processing, or CEP, plays a direct role in increasing productivity and ensuring infrastructure and operations run as smoothly as possible. Along with protecting the functionality of applications, complex event processing serves as a direct line of defense against fraud and malicious attacks against your network and infrastructure. Complex event processing is directly responsible for the development of secure and advanced IT environments. Because of CEP, application performance management tools are able to work with a wide array of applications and architecture types, such as SOA and legacy applications. This is made possible as complex event processing engines are not limited to working with a single source for its data. It’s able to accurately correlate information from a wide array of sources, which allows it to delve deep into how IT errors and issues directly affect the key performance indicators in business metrics. Allows for simple and effective establishing of event pattern expectations, which may be used to design and create processes based upon contextual delivered information. Enhances the ability for network scalability without fostering a vulnerable security environment. Enables wide aspect event harvesting, which allows each event/transaction to be visible not only on the IT level, but also at the business level. This feature allows businesses to understand how each transaction is affecting their business functionality and performance. It’s only with this information that effective changes can be implemented. Recognize established patterns based upon the parameters set forth by the network administrator. By showcasing patterns across multiple platforms, or applications, administrators are able to view trends in application use as well as spikes in abnormal behavior, which may otherwise go unnoticed. Enacting a company-wide policy that includes some type of application performance monitoring is one way to ensure that these things don’t go unnoticed. Overall, complex event processing allows data gathered through an APM tool to be delivered in such a way that IT organizations are able to improve application performance, availability (uptime) and visibility to all users. Its insightful conclusions are a must-have for all businesses who desire a means of reducing the impact of application errors while simultaneously working to the detect anomalous behavior, which could indicate fraud or a malicious attack. Establishing a stable and high-performance application environment is not a simple task. However, with the use of complex event processing within your application performance management solution is able to streamline necessary information to help decrease the time spent troubleshooting application errors and issues. While not every business requires the use of CEPs, if you’re seeking a stable application environment, this is an essential component to any network infrastructure. Unlike standard APM, cloud application performance management, or CAPM, handles instances in a much different manner. If your business has begun implementing cloud-based applications, it’s essential that you understand not only the differences within how these applications operate when compared to their static server counterparts, but also how the monitoring of such applications differs. Traditionally, application performance management solutions monitor the CPU, memory and disk utilization of applications; also referred to as the end-to-end latencies of performances. While this is an essential aspect of application monitoring, cloud application performance management focuses primarily on the user experience for any application. By combining the back-end functionality with the user-experience element, CAPM tools is able to ensure the performance and usability of applications is as effective and streamlined as possible. CAPM is a complex process as it allows IT organizations to monitor an application from the inside-out. Generally, CAPM tools begin with identifying response times between each request and analyzing latencies that users experience from the beginning of a process to the very end. The most effective tools are those that allow you to not only monitor real-world occurrences, but also virtual simulations to ensure each process functions as it should. At the cloud instance, it’s essential to be able to separate each performance component within a network, which provides a deeper look into the application to determine the root cause for issues and errors altering the performance of each application. When a business utilizes the cloud as part of its communication mechanism, it’s introducing a vast array of unpredictable and unknown performance markers. The only way a business is able to achieve accurate performance measurement is by analyzing a large number of instances, or transactions, and then averaging them. As you utilize the Internet as a primary portion of your application, or network, infrastructure , the pathway of your network can unexpectedly change. It’s this unpredictable nature of cloud applications that many businesses fumble with. Cloud application performance management solutions take into account the non-stable environment the cloud provides, and utilizes advanced and complex monitoring elements to provide the deepest level of performance management and issue identification. While utilizing the cloud to host applications is becoming a requirement due to the complex and ever-evolving IT industry, monitoring and analyzing cloud application performance is just as complex and demanding. CAPM tools, resolve many of these challenges as they allow IT organizations to focus on not only the end-user experience, which is vital when dealing with cloud based applications, but also back-end processes by assigning specific monitoring agents over each process. When combined with a thoughtful infrastructure and continual management, the performance and dependability of applications are significantly increased. CrispyTech.com · APM & UI news and research!